From the rugged coast of British Columbia, Canada, metal songwriter LEAH is turning heads across the globe. Fans describe her as “the metal Enya” and describe her songs as “Loreena McKennitt meets DELAIN.” In a sea of mediocre symphonic metal, LEAH stands out not only with her magnetic twist of Celtic and World influences, but also her well-known ethereal vocals. Her debut self-released album “Of Earth & Angels” received international critical acclaim, landing her on "The Best Symphonic Metal Album" Metalstorm Awards for 2012. 2014 was very successful year for Leah as she raised over $27,000 through Indiegogo via her fans to record and produce a new full-length album. LEAH sets the bar for both independent artists and the symphonic metal genre alike, which is often dependent on touring as the primary means of gaining new fans and marketing. Being a full-time mother and family woman, Leah achieves all her success having never done a tour in her entire musical career. She hopes to tour one day, but in the meantime plans to continue her path as a recording artist and songwriter, as well as help other artists achieve success in the independent music arena. 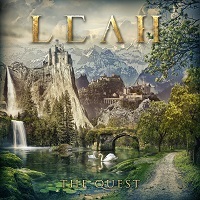 Today, she comes to us with her newest release, titled “The Quest,” which contains ten tracks. Coming in strong, the album leads off with the ten-minute title track. Leah’s vocals are whispers in the wind at first, charming and alluring, and with perfect pitch. The music seems to echo as her vocals change, gaining in intensity and then backing off again. The progressions are fascinating…the push and pull sounds like you are caught on the battlefield between a wicked fire-breathing drake and armies on unicorns as steeds, and there are explosions that light the dawn’s sky in a dazzling display of colors. It ends in clear and victorious vision. “Edge of your Sword” opens in an upbeat method, with the bass guitar thumping away, creating a steady pace. The chorus is big and rich, followed by a scathing guitar solo. “Lion Arises” is a bit slower and perhaps a bit bossier as well. The sound is somber at times, but big and powerful at others. The fullness of the song is bursting at the seams, while Leah’s tender vocals turn bold and fearless at the drop of a dime. “Ruins of Illusion” opens softly, with pensive vocals, piano notes and a light, steady percussion. The flutes really give it that authentic Celtic sound, but when the guitars come in they take over with pride and vision. “Labyrinth” is a pretty song most of all, with light and airy flutes and a slower pace, allowing Leah’s vocals to really shine in their simplicity. “Abyss” has a real dreamy sort of quality to it. It’s like a beautiful and vibrant brook awakening from a slow clearing in the mist. It crescendos towards the end in a masterful arrangement of emotions. “Oblivion (Between Two Worlds)” is a darker song that stays hidden, with pensive vocals and flutes. Leah teases with her pretty vocals until the chorus comes out, and then it’s on full display. She talks about being done living in the shadows and living without regret. “Ghost upon a Throne” has a very accessible sound, and would make a great video single to showcase the album. It’s strong and powerful, with a solid backbone and enough supporting arrangements to really make it shine. “The Water is Wide” closes the album, sung acapella with just some subtle background music. But, it’s Leah’s voice that steals the show here. It cuts through you like “Amazing Grace” does, stirring your soul and leaving goosebumps in their wake. Overall, this is very well put together album, with crystal clear production, highlighting the amazing voice and songwriting talents of Leah McHenry. She has thought of it all here, and there’s a little bit of something for everyone. Tender, sweet and pensive music, powerfully emotive music, everything that lies in between, and that wonderfully mesmerizing voice to pull it all together. The guest musicians are also a noteworthy collection of seasoned performer who fill in all the details. I would be remiss if I did not mention the talents of Oliver Phillips here, who did an absolutely smashing job of arranging this ambitious material, because he really knows what he is doing. Long live the Queen!